I have spent much of the afternoon in the rectory garden, cleaning up the driveway, getting rid of weeds on the patio that seem to return faster than I can deal with them, and tidying up the garden in preparation for Sunday next [30 July 2017]. This is the Seventh Sunday after Trinity, but it is also the Fifth Sunday in the month, which means we are having a united service for the Rathkeale and Kilnaughtin Group of Parishes. Because the fifth Sunday falls in a summer month, we are celebrating the Parish Eucharist in the Rectory Gardens in Askeaton, and we are following this with a parish barbecue. The Orthodox talk about the ‘Liturgy after the Liturgy.’ This normally refers to going out into the world to serve God. At the end of the Liturgy, before the final blessing, the priest says, ‘Let us go forth in peace,’ and the congregation responds, ‘In the Name of the Lord.’ Then comes a final prayer, summing up all the prayers and wishes and re-affirming the faith, establishing the bridge between the Liturgy at the altar and the Liturgy in the world, where we are all celebrants. When there are two or more priests serving, this prayer is offered by ‘the junior priest,’ the priest most recently ordained, the one who has most recently left the lay believers to become one who serves at the altar, because he is best suited for this the one who should remember the lay condition more vividly. These words are an instruction, a command, to go out into the world in peace and go about our lives in the name of the Lord rather than following our own whims and desires. The Romanian Orthodox theologian Father Ion Bria wrote, ‘The “liturgy after the liturgy” is thus a way of expressing how Christian worship is inseparable from committed engagement in society and culture.’ We are called to be in deed every day, not just on Sunday, and in every place, not just within the confines of the church walls. But there is also another, cultural understanding, of the ‘Liturgy after the Liturgy.’ After the Sunday Liturgy, many people in Greece will adjourn to a nearby taverna or café, and continue to build up the Body of Christ, in fellowship and friendship. The barbecue in Askeaton on Sunday afternoon is an important way of building up the friendship, fellowship and family feeling that should be at the heart of a parish. But the ‘Liturgy after the Liturgy’ is only meaningful when we actually celebrate the Liturgy first together. And this afternoon’s few hours in the garden have given me time to think again about my sermon for Sunday, which I have almost finished writing. Behind and beside the Rectory gardens, the fields have been mowed in recent days and in the fields of green and gold, the yellow bales are waiting to be collected beneath the blue skies and white clouds in the summer sunshine. In the Gospel reading for Sunday (Matthew 13: 31-33, 44-52), Christ compares the kingdom of heaven with a seed that has been sown in a field (verse 31) or like treasure hidden in a field (verse 41). 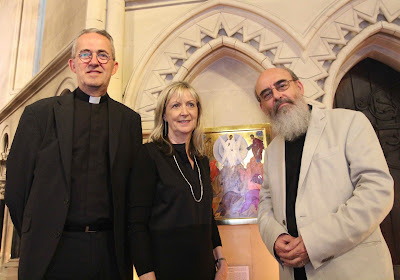 Christ Church Cathedral, Dublin, is offering visitors the opportunity to engage with their spirituality on a different level through its Summer Exhibition of Icons. The exhibition, which features the work of iconographer Adrienne Lord, opened towards the end of June and will continue until the end of September. The icons are for sale and the proceeds will be donated to charity. He said that the word ‘icon’ had been demeaned in recent years – we have icons on our computers and we talk about people, such as film stars, in terms of being icons. However, he said Christ is the icon of God and the first icon is Christ. He pointed out that we do not worship icons but can be drawn into a spiritual experience by an icon. He said there was a temptation to look at icons as idolatry but this was not the case and neither is sufficient to look at an icon as a work of art without regard for its spiritual dimension. Canon Comerford paid tribute to Ms Lord’s interpretation of the icons, which have mainly been inspired by Greek as well as some Russian icon writers. ‘These icons all give you the idea that we do not have a static relationship with God but rather a dynamic relationship with God … What you are looking at is an interpretation of art, beauty, dynamism and spirituality,’ he said, adding that icon writers are among the first and last theologians because they allow us to speak about God but also to enter into a relationship with God.